Diver training agencies are in the business of selling scuba classes and would like you to believe that the only way to develop your knowledge and skills is to sign up for one of their vast array of courses. While time spent with an instructor is indeed a very good way to improve your technique, you do have other options, a number of which I was reminded of recently. The other week, I joined a dive liveaboard charter and two of the fellow guests were very new divers, with four and 24 lifetime dives, respectively. We were in Raja Ampat, where the diving is fabulous, the corals are lush and the fish life as plentiful as it is anywhere in the world. It is also a patch of ocean where currents can be intense and a number of the best dive sites can be tricky if the conditions are not perfect, which is rarely the case. Raja Ampat is not a place for beginners. The liveaboard usually attracts experienced divers, and there are no instructors on board, only dive guides whose job it is to make sure the divers get the best possible dive at each site by leading them along the optimum route and spotting marine life as they go along. One of the dive guides was placed in charge of the two new divers and, as soon as he saw on the checkout dive on day one how new they really were, he made it his mission to do his utmost to teach them how to be better divers. Over the week, I watched him teach them how to weight themselves correctly, how to descend properly, how to ascend and do a safety stop, and how to raise a surface marker buoy from their safety stop to show the tender boat where they were. He showed them how to swim more efficiently against a current and how to use a reef hook to stay in place when a current is running. He instructed them on how to swim horizontally using a variety of fin kicks and how to remain motionless in the water to observe marine life up close and take pictures of it. (Of course, despite their lack of experience the divers both had cameras!) On deep dives, he reminded them to concentrate, not get distracted and monitor their computers more frequently, and he briefed them and guided them on their first night dive, which they loved! By the end of the trip, the two divers were transformed. They were comfortably accomplishing dives in a high current that even veteran divers were shying away from. They were working together as a team and becoming less dependent on the guide with every dive. Did they receive a dive card at the end of the week? No! Did they become better divers? Unquestionably! Did the guide feel a sense of considerable pride in what he had achieved? Absolutely! Will the new divers recommend the guide and his operation to friends and the dive community at large? Every time! This was a perfect example of how excellent diver training does not always need to be about handing out reading material, completing quizzes and card collecting. The success of the week, of course, was not solely down to the efforts of the dive guide. It was also due considerably to the students’ willingness to learn. 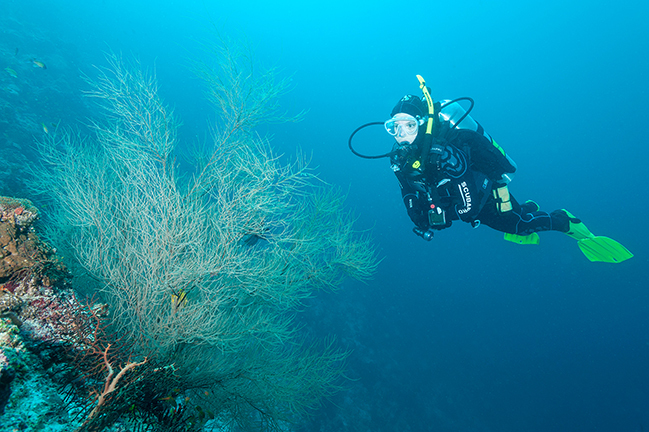 While you are fun-diving with professionals, do not be afraid to seek advice on equipment, technique or how to manage certain diving environments. You just have to pick the right moment when they are not busy with other things and ask. Most will be willing to help and will often be very pleased you asked. It is much better to have divers in your charge who confess they do not know something and want to learn, than to deal with folk who are unwilling to admit ignorance, pretend to know everything and then get themselves into difficulty. Living in Bali, where there are as many yoga studios as there are dive shops, I have a number of friends who practice yoga under the tutelage of an instructor, sometimes several times a week. The instructor takes the students through the exercises, positions and skills, demonstrating how they should be performed, gently advising them with suggestions and praising them fulsomely when progress is made. The classes keep the students active, enthusiastic and yoga fit. This is a training concept that could easily be imported into the world of scuba diving. Regular confined water scuba circuit practices for divers would improve their skills immensely as well as keep them in tune and dive fit between trips. Instructors would also gain from the regular work and derive important job satisfaction from building a group of highly capable divers. Like yoga classes, there would not be any cards handed out, (although, if you need such things, you might be able to get an attendance certificate for your “Me” wall!) Assuming a sufficient number of divers signed up and turned up regularly, sessions could be priced about the same as yoga classes, with the group sharing the cost of the pool booking and the instructor’s time. Keeping dive fit is important. No matter how experienced we are, most of us will become better divers during a dive vacation and, by the end of it, swimming on scuba is as natural as walking. Within a few months, however, highly-polished instincts become dulled, finely-tuned skills go off key, and by the time we come to the next dive trip, we find we have to climb the learning curve again. It is no coincidence that, wherever people dive, the largest number of accidents take place at the beginning of the season. Traditionally, dive clubs have taken on the job of keeping us training and dive fit between trips, and I was reminded of this when I was asked to give a talk at a dive club in Singapore last month. Weekday evening meetings at the club and organised weekend dives allow experienced divers and instructors to mingle and dive with newer folk on an informal and social basis, with everyone benefitting from the consequent exchange of information and advice. To find a dive club in your town, ask around. Enterprising urban dive shops often establish clubs to keep local divers active and involved in the sport. If you can’t find a club, then think about establishing one of your own and recruiting some like-minded, locally-based divers to join you. Simon Pridmore has been part of the scuba diving scene in Asia, Europe and the USA (well, Guam) for the past 20 years or so. He is the bestselling author of Scuba Confidential – An Insider’s Guide to Becoming a Better Diver and has just published a new book entitled Scuba Professional – Insights into Scuba Diver Training and Operations. Both are available from Amazon in a variety of formats.